So, yet another bird for the weekend count! I know it was a Sharpie and not a Cooper's Hawk mostly because of the size. 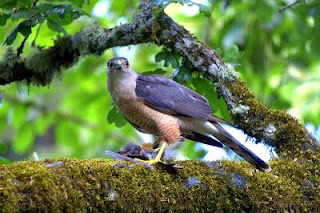 A Sharp-shinned hawk is not much bigger than an robin or a jay...though with all hawks, females are nearly big as large as males. A female Sharp-shinned Hawk could be about the size of a (small) male Cooper's and a large female Cooper's could be nearly as large as a Red-tailed hawk! So what was the other clue? A Sharpie's tale is squared-off...the edges are 'sharp' compared to a Coop's more rounded tail-feathers. Just another play on words to help remember differences! 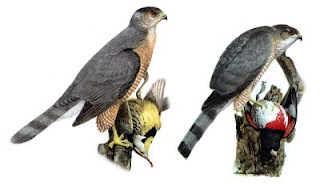 According to size alone, that should be a male Cooper's hawk on the left and a female Sharp-shinned hawk on the right. While it's hard to see here, the slightly longer tail (both physically and proportionally) on the Cooper's has a noticeably wider, pale terminal band. Also, the Coop's head is larger and extends past the bend in a flying bird's wing. Click either bird's name above and see many more photos of each species. Another tidbit from Bill Thompson III's Identify Yourself : "...the rule of thumb is that Cooper's are the longest accipiter and sharp-shinneds are the most compact. The longer tail and greater head projection of Cooper's make it seem longer than it is wide. The shorter tail and smaller head and proportionally longer wings make sharp-shinneds seem more compact and shaped more like a buteo, such as a broad-winged or red-tailed hawk." You folks may have seen an online pal's comments here from time to time...or perhaps you've visited one of his websites that I list on the right: Burque Birding or Bosque Bill's Place. I frequent both and find his wealth of information more than helpful and his photographs stunning. Here are some of Bill's hummingbird shots. At any rate, since we just discussed how difficult it can be for a novice like me to get the hang of two similarly-marked birds, Bill let me include a couple of his videos here, to help show the two little brown, stripy birds I wrote about earlier this weekend. You can find more of BosqueBill's video clips here. ...though it's not that bad today. ...in all three color variations. I am able to add a Hairy Woodpecker to my weekend Count, however. There seem to be 1-2 pairs of Woodies and 3-4 pairs of Downys who live around my yard. I probably see the smaller woodpecker twice or even three times as often as the larger one. And perhaps because they love the fat-worms I offer them, I counted eleven (11 !!!) 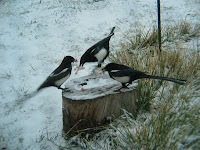 magpies in my yard, all at once. 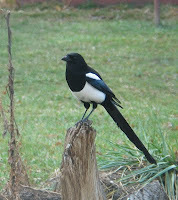 Who knew a number of these birds is called a 'Murder of Magpies'? Well, I tell ya, watching them eat bits of raw meat and fat makes the name really seem to fit! I got a picture of the new squirrel baffle I built yesterday, see the dove shots below. I like it better than the first baffle...but both work just fine. I've yet to find a squirrel in a feeder from a protected pole, or a feeder torn apart and ruined by visiting raccoons, either. 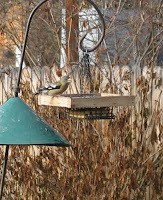 And, I offer two pictures: how to tell if the bird on your suet feeder is a Hairy or a Downy Woodpecker? Size is your first clue; the Hairy is noticeably larger.While the photos are not an exact comparison ...you should be able to see one bird is diminutive compared to the huge one; use the feeder as the comparrison. What is it called when you use words to cue a lable? Try: Diminutive Downy and Huge Hairy. Measure your feeder; discover how long six-seven inches compared to over nine inches. Perhaps even mark your feeder, if you have to. Anyway, these are two photos, different species that look nearly identical, taken from about the same spot on the same feeder. 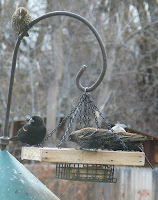 On a standard, single-cake suet-cage, a Downy looks tiny and a Hairy is longer than the cage is. I hope it helps. I love those big windows in my kitchen; the three curve the entire width of the room and even just walking through the kitchen affords me a nearly perfect view of my backyard counting area. And here you can see the new baffle. It's made from a piece of light-weight stove pipe and duct tape. The one I made a year ago is still holding up fine, so I'm pretty pleased with my $5 DIY Squirrel Baffle design. Mostly I try to discourage doves and pigeons from coming here...but occasionally am tickled to find an unusual one. I thought I saw a white edge along the wing of a dove sitting in a feeder. 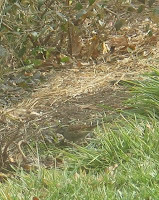 Grabbing my bad little camera, I looked for the small, black, crescent-shaped smudge just below the eye...it was there! And then the bird noticed me at the window and stretched up just before taking off. Yup, it was a White-winged Dove! On a related topic, I was wondering if the Eurasian rats, I mean Eurasian Collered-dove and the White-winged dove might cross-breed. Some of the EUCDs almost look to have a white edge along the front of the wing; but no, I imagine they do not cross-breed. Actually, White-winged doves are more closely related to the smaller Mourning dove; both are the family "Zenaida"...and both have the pretty little cheek mark. White-winged Dove: are said to sound like "Who cooks for you?" Flying rats...I mean Eurasian Collared-dove (I mean seriously, what color IS a Eurasian?) Their call is far more guttural and boring. Clips are from YouTube, photos are mine. There is no question I enjoy watching the birds. 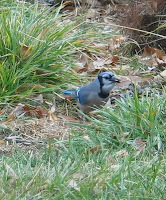 I do what I can to attract them to my yard, including spending an exorbitant amount of money feeding them and re-creating my yard to include more fruiting bushes and trees...for the birds. When I can watch them for a reason other than avoiding housework, so much the better! I'm counting birds for Project FeederWatch (see the post just below). Yeah...call me a geek, but I like being a citizen scientist. I also enjoy doing what I can to help mitigate the problems birds are having these days...fractured habitat being only a small problem. I can't encourage people enough to plant native plants; that's what the birds look for and they just happen to be the easiest plants to grow. 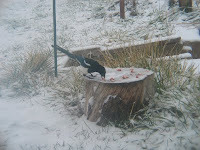 In addition to feeding smaller birds, I just love the big corvids; from jays to crows to magpies...I encourage their visiting. I put out at least one cup of kibble every morning. 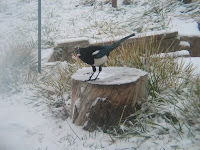 Mostly it's the Black-billed Magpies that come, but often, this time of year, so do the Blue Jays. 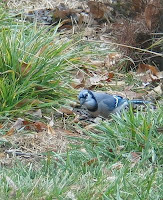 Once, I had a Stellar's Jay visit, too. And last week, there was an American Crow on my back step. Course, that I haunt the grocery store for fat-scraps and today even garnered over a pound of actual meat scraps (free!) could be why they come. Not only do I often soak the kibble in bacon fat or water (fat is VERY important this time of year...and is why doughnuts are better for birds than bread), but I also put out meat and fat scraps for the big guys. (no poison!) mousetraps onto the feeder. And when I cook bacon, before I separate the strips, I first cut off the ends of excess fat into narrow strips. These strips of fat can be sort of pulled out into fat-worms; the birds love 'em! This fat bird has crumbs on his bill...can you see the bit of beef? 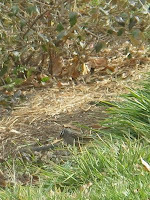 For Project FeederWatch, a person is to count the largest number of a single species in the count area. Each person picks their own count area (mine everything I can see inside the tall trees that surround my yard), watches as long as they want for two consecutive days per week. Fly-overs do not count. that I saw today. I'm so sad to hear they are on a serious decline. 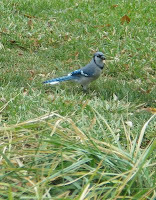 They are the sweetiest sounding bird...one of the first bird-calls I learned to recognize. The gentle peeps remind me of chickens' chicks. Oh, and yes...occasionally I get birds of prey; owls, hawks and other raptors. 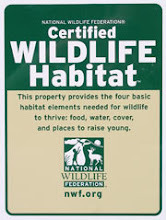 It's all about habitat; when I had a koi-pond I got ducks and herons. Here I draw lots of birds, so I get those birds which feed on birds. Not often...and it doesn't bother me a bit; though I do hope more starlings, collared-doves and house sparrows (weedie-birds not indigenous to America) get hit than anything else! Watching the Red-winged Blackbirds feed (those stripy, brown ones are the females or young males! ), it struck me how seldom one sees the 'red' this time of year. I wonder if they hid it, so as not to agitate neighbors, so that they can all feed and fatten up for the winter...and rest after the breeding season. Hey, that's tough work! I wonder if my thoughts have merit. What a life; I sit most mornings with my coffee and watch out the huge bay-window...watching, sometimes counting, often photographing the birds that visit. Anyone can play…and I encourage folks to include children. The more kids find an interest in the natural world, the better off our future world will be. Anybody near here that needs help getting started, let me know; I’d be glad to help; teachers, newly retired folks, people who want to make a difference or folks who just want a new hobby! Please remember...it's supposed to be FUN! While it's just to be two days a week, you can count birds for less than an hour one day and all day the next, you can skip a week, you can count from inside or out and YOU get to pick your counting area. How easy is that?! 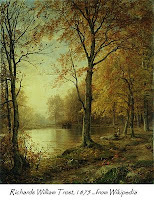 The expression 'Indian summer' has been used for more than two centuries and is an informal expression given to a period of sunny, warm weather in autumn in the Northern Hemisphere. Typically this occurs in late October or early November, after the leaves have turned following an onset of frost but before the first snowfall. Since, untypically, we have already had several snows this season, I suppose we’re enjoying an unusual Indian summer, too. Still, we have had and are to continue to have warm, clear weather for the next several days. In parts of the south-eastern United States, 'Indian summer' is colloquially used to describe the hottest times of the year, usually late July or August. But in the South, as elsewhere in the US, this period is more commonly known as the dog days, in reference to the position of Sirius, the 'Dog Star' and brightest star in the Northern Hemisphere, besides the sun. The term 'Indian summer' is also used metaphorically to refer to a late blooming of something, often unexpectedly, or after it has lost relevance. This is comparable to the use of the term renaissance (French for "rebirth") in the sense of 'revival', but it carries the added connotation that the revival is temporary.